William Garden was born November 5, 1918 in Calgary, Alberta. His family moved to Oregon in 1924 where he started school, but by 1928 they had relocated again to the Montlake District of Seattle. In January,1935, upon graduation from high school, he enrolled at the Edison Boatbuilding School where he learned new construction for both sail and power; then went to work for Andrew’s Boat Company on Portage Bay, not far from his home. His next project was construction of his schooner GLEAM which he sailed throughout the San Juan Islands, around Vancouver Island, and along the coast of British Columbia when time permitted. In 1940 he formed a partnership with another builder, Dave Leclercq, at an old mill site on Portage Bay. They built five sailing yachts before closing shop in 1942 to work at established yards building boats for the war effort. At the age of 24, with 51 boats designed (mainly work boats, tugs, trollers, and sardine boats) he was drafted into the US Army and sent to the Adak Ship Repair Base in the Aleutians. As he described it “I was the only man in the Army employed in what I liked doing”. Discharged in the spring of 1946 as a Master Sergeant, he returned to Seattle and spent time putting GLEAM back into commission and designing halibut boats, trollers and the 30-foot cutter BULL FROG. That summer he and his longtime friend John Adams took a two month holiday cruise with GLEAM to the north British Columbia coast and back around Vancouver Island (one of his later cruises was documented in the April 1951 issue of YACHTING, “Beachcombing the Goose Islands”). 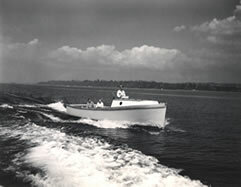 In the fall of 1947 he was licensed as a Naval Architect and in the following year took in additional design work on fishing boats, yachts and when time allowed, RAIN BIRD, which was to replace GLEAM as his boat of choice. 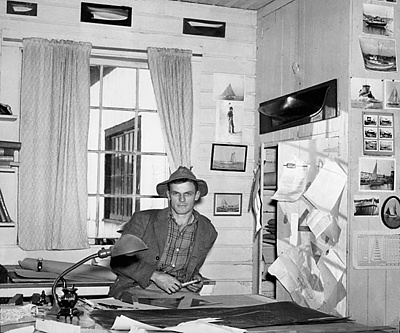 In 1951 he moved his office from the old boatshop site on Portage Bay to the Pacific Fishing & Trading Co. building on the ship canal in Ballard; then in 1954 the office was moved to Maritime Shipyards with a participating interest in the yard. This partnership produced several yachts, work boats, pile drivers, etc. Bill and N.A. Phil Brinck worked together on miscellaneous projects through the mid 50’s, and in 1956 Brinton Sprague, a mechanical engineer and Bill’s good friend and mentor joined him for several years, his expertise providing a major contribution to the firm. A 1957 article in Marine Digest detailed 62 boats in construction valued at nearly 2 million dollars and another 12 on the boards. In 1959 the design office was moved from the Maritime Shipyards location to a new building above Lockhaven Marina overlooking the locks and ship canal traffic. For a time he gave serious thought to relocating to New Zealand in order to provide a more ideal location to raise a family, and Victoria, BC was chosen in 1968 as an interim move while projects in process where completed. Later a nearby island was purchased as an interesting location for design offices. Shops and a self-sufficient island home were established in 1969 and from then until the present he has operated from this location. 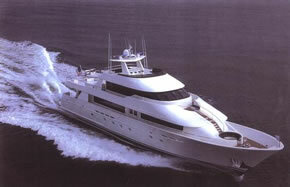 His recent projects have primarily involved yacht designs, the largest being 231 feet in length. For information on individual designs and for an index of all the designs held at Ships Plans visit the William Garden Collection.